In recent years the supply of Traumeel® in the United States dwindled. Several companies attempted to flood the market with products treating the same indications but with substantially different ingredients or more ingredients or more concentrations, but to no avail. A formula that has withstood the test of 80 years is not easy to replace. * Compare to Traumeel®. Traumeel is a brand name owned by Biologische Heilmittel Heel GmbH. 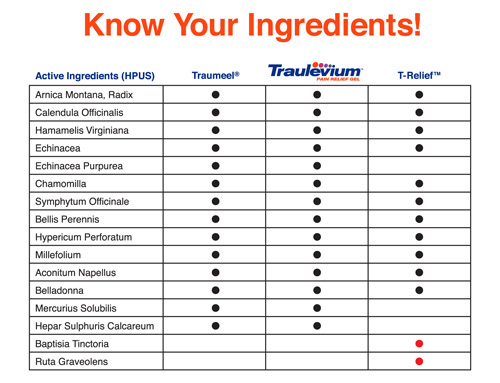 Traulevium is not associated with the brand owner. ** T-Relief® is a brand name owned by MediNatura Inc. Traulevium is not associated with the brand owner. ***Traulevium™ is a brand name owned by Medical Technology Products, Inc.
***Guarantee is limited to one bottle per customer.